(China Times) County mayors, the Internet is subverting your powers. By Huang Che-bin (黃哲斌). August 22, 2007. Which is local news? Ma Ying-jeou's "long stay" in Tainan? The opening of a casino for tourists in Peng Hu? The selling of senior job positions at the Kaohsiung Bank? The construction of the Su-ao-Hualien Super Highway? The possible demolition/relocation of the Losheng Sanitarium this September? When I joined China Times, I was a society news reporter in Tainan and I asked myself similar questions a countless number of times. The most common answer is: When something is relatively unimportant, has no national impact and is of no concern to people living outside, then it is local news. Only when the Taipei office thinks that it is important will it be elevated to national news, or even "key important news." This logic has existed everywhere in the world all along, even though there are some flaws. But there are two recent examples that showed that "small places have big news" and the Internet is challenging the traditional definition of journalism as well as the local politicians' sense of splendid isolation. First of all, Yilan county is stopping its children's festival for budgetary reasons. With respect to the fiscal condition of the government, it seems perfectly reasonable because it is known that the local government has been financially strapped and running a deficit in recent years. The national government also kept quiet because it was afraid that there would be a popular demand for it to take over the festival. So this matter might have been dropped into the 'local news' drawer and be forgotten. After all, there are so many folk festivals in Taiwan that the Tourist Bureau could not name all of them. But the Internet did not give up as the bloggers criticized the Yilan county mayor for shirking responsibility. There was a campaign to save the children's festival and they even collected more than 1,300 signatures to recall the county mayor Lu Kuo-hua. Some bloggers also gave deeper thoughts about the issues of local development such as the use of a small number of festivals to stimulate short-term spending at the expense of neglecting the local environment and culture as a whole. 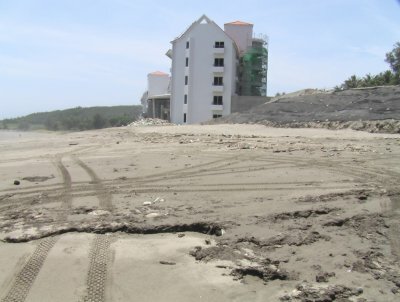 The second case was even more astonishing and infuriating: the development of Shanyuan beach in Fugang, Taitung. 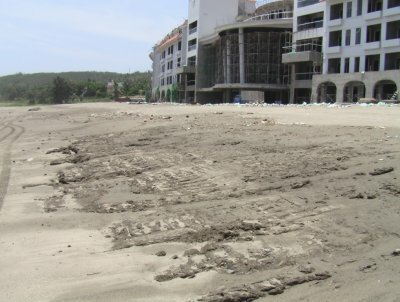 China Times reported that the vacation village at Meili Bay appeared to have been illegally developed while circumventing environmental protection laws. 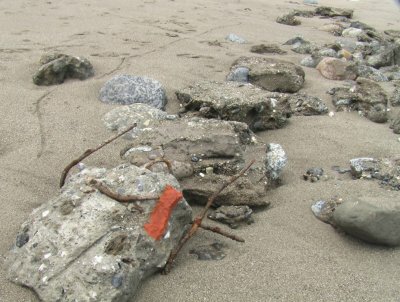 The local environmental protection organizations revealed that a lot of construction waste materials were buried right underneath the beach. The Environmental Protection Administration believed that the applicant's Phase I plan only included 0.997 hectares for the hotel, but 5.99 hectares appeared to have already been developed. Therefore, the Environmental Protection Administration asked the county government to halt construction. 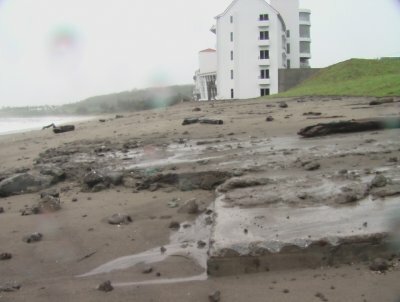 But the Taitung county Environmental Protection Administration appeared to be protecting the developer and resorted to using judicial reviews twice so as not to enforce the stop-work order. This case was exposed due largely to the Taitung Environment Protection Alliance using the civilian journalism platform PeoPo. 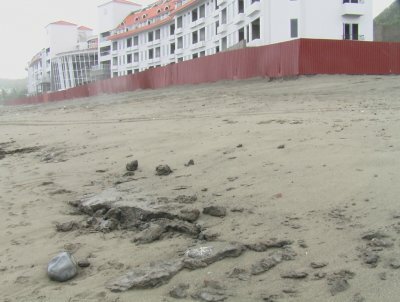 They described the importance of the ecological and geographical importance of Shanyuan Beach and listed all the illegal activities of the developer. 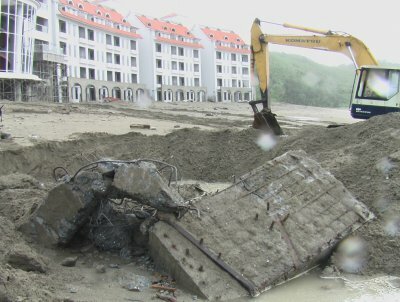 After typhoon Sepat passed through, the Environmental Protection Alliance secretary went to Shanyuan Beach and took pictures of the large amounts of construction waste uncovered after the storm washed away the sand on top. They provided the material to the media, some of whom reported on this case. But most of the media continued to file this under the "local news" drawer and the case has not yet drew national attention. But we see from the case how "developer + local government + local elected representatives + some local reporters" acted together to cover up the truth while the environmental protection organizations clash with those special interests in an obscure corner. It is noteworthy that the environmental protection organizations use the civilian journalism platform PeoPo and the bookmarking website HEMiDEMi to bring the Shanyuan Beach development to the attention of netizens and raise discussions. In so doing, they have become a pressure group. Will the appearance of Internet civilian media allow them to break through the traditional "local news" framework and get more attention? How will those local government bureaucrats with their strong local powers respond to the challenge of the ubiquitous Internet? Perhaps one day, the definition of "local news" will be re-written for the Internet. Perhaps the day is already here.